The lumbar spine is designed to be incredibly strong, protecting the highly sensitive spinal cord and spinal nerve roots. At the same time, it is highly flexible, providing for mobility in many different planes including flexion, extension, side bending, and rotation. An image depicting the lower lumbar spine can be seen below. The lumbar vertebral bodies are distinguished from the thoracic bodies by the absence of rib facets. The lumbar vertebral bodies (vertebrae) are the heaviest components, connected together by the intervertebral discs. The size of the vertebral body increases from L1 to L5, indicative of the increasing loads that each lower lumbar vertebra absorbs. 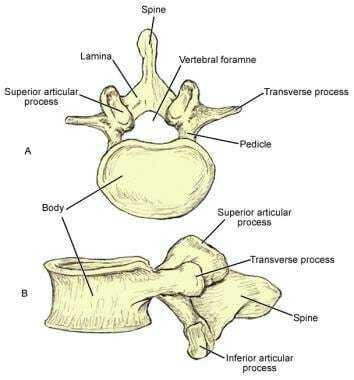 Of note, the L5 vertebra has the heaviest body, smallest spinous process, and thickest transverse process. The intervertebral discal surface of an adult vertebra contains a ring of cortical bone peripherally termed the epiphysial ring. This ring acts as a growth zone in the young while anchoring the attachment of the annular fibers in adults. A hyaline cartilage plate lies within the confines of this epiphysial ring. Each vertebral arch is composed of 2 pedicles, 2 laminae, and 7 different bony processes (1 spinous, 4 articular, 2 transverse) (see the following image), joined together by facet joints and ligaments. Lumbar vertebrae are characterized by massive bodies and robust spinous and transverse processes. Their articular facets are oriented somewhat parasagittally, which is thought to contribute the large range of anteroposterior bending possible between lumbar vertebrae. Lumbar vertebrae also contain small mammillary and accessory processes on their bodies. These bony protuberances are sites of attachment of deep lumbosacral muscles. The pedicle, strong and directed posteriorly, joins the arch to the posterolateral body. It is anchored to the cephalad portion of the body and function as a protective cover for the cauda equina contents. The concavities in the cephalad and caudal surfaces of the pedicle are termed vertebral notches. Beneath each lumbar vertebra, a pair of intervertebral (neural) foramina with the same number designations can be found, such that the L1 neural foramina are located just below the L1 vertebra. Each foramen is bounded superiorly and inferiorly by the pedicle, anteriorly by the intervertebral disc and vertebral body, and posteriorly by facet joints. The same numbered spinal nerve root, recurrent meningeal nerves, and radicular blood vessels pass through each foramen. Five lumbar spinal nerve roots are found on each side. The broad and strong laminae are the plates that extend posteromedially from the pedicle. The oblong shaped spinous processes are directed posteriorly from the union of the laminae. The 2 superior (directed posteromedially) and inferior (directed anterolaterally) articular processes, labeled SAP and IAP, respectively, extend cranially and caudally from the point where the pedicles and laminae join. The facet or zygapophyseal joints are in a parasagittal plane. When viewed in an oblique projection, the outline of the facets and the pars interarticularis appear like the neck of a Scottie dog (see the image below). Drawing of 2 lumbar segments viewed from an oblique angle. The outline of the facets and the pars interarticularis has the appearance of the "neck" of a Scottie dog. Between the superior and inferior articular processes, 2 transverse processes are projected laterally that are long, slender, and strong. They have an upper tubercle at the junction with the superior articular process (mammillary process) and an inferior tubercle at the base of the process (accessory process). These bony protuberances are sites of attachments of deep back muscles. The lumbar spine has an anterior, middle, and posterior column that is pertinent for lumbar spine fractures (see the following images). The mobility of the vertebral column is provided by the symphyseal joints between the vertebral bodies, formed by a layer of hyaline cartilage on each vertebral body and an intervertebral disc between the layers. The synovial joints between the superior and inferior articular processes on adjacent vertebrae are termed the facet joints (also known as zygapophysial joints or Z-joints). They permit simple gliding movements. The movement of the lumbar spine is largely confined to flexion and extension with a minor degree of rotation (see the image below). The region between the superior articular process and the lamina is the pars interarticularis. A spondylolysis occurs if ossification of the pars interarticularis fails to occur. The 3-joint complex is formed between 2 lumbar vertebrae. Joint 1: Disc between 2 vertebral bodies; Joint 2: Left facet (zygapophyseal) joint; Joint 3: Right facet (zygapophyseal) joint. Discs form the main connection between vertebrae. They bear loading during axial compression and allow movement between the vertebrae. Their size varies depending on the adjacent vertebrae size and comprises approximately one quarter the length of the vertebral column. Lateral drawing of the 3 spinal columns of the thoracolumbar junction. The anterior column (black dotted line) includes the anterior spinal ligament, the anterior annulus fibrosus (AF), the intervertebral disc, and the anterior two thirds of the vertebral bodies. The middle column (red dotted line) includes the posterior aspect of the vertebral bodies, the posterior annulus fibrosus, and the posterior longitudinal ligament (PLL). 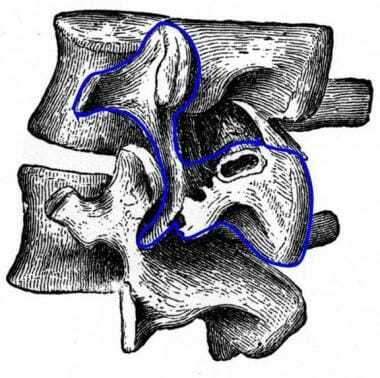 The posterior column (thick blue dotted line) includes the entire spine posterior to the longitudinal ligament (thick blue dotted line). ALL = anterior longitudinal ligament; ISL = interspinous ligament; LF = ligamentum flavum; NP = nucleus pulposus; SSL = supraspinous ligament. The annular fibers are firmly attached to the vertebral bodies and are arranged in lamellae. This annular arrangement permits limiting vertebral movements, reinforced by investing ligaments. 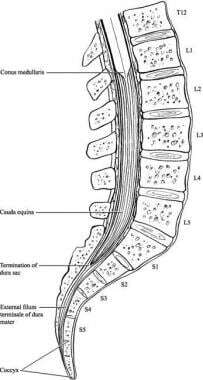 The ALL covers the ventral surfaces of lumbar vertebral bodies and discs. It is intimately attached to the anterior annular disc fibers and widens as it descends the vertebral column. The ALL maintains the stability of the joints and limits extension. The PLL is located within the vertebral canal over the posterior surface of the vertebral bodies and discs. It functions to limit flexion of the vertebral column, except at the lower L-spine, where it is narrow and weak. The supraspinous ligament joins the tips of the spinous processes of adjacent vertebrae from L1-L3. The interspinous ligament interconnects the spinous processes, from root to apex of adjacent processes. Sometimes described together as the interspinous/supraspinous ligament complex, they weakly resist spinal separation and flexion. 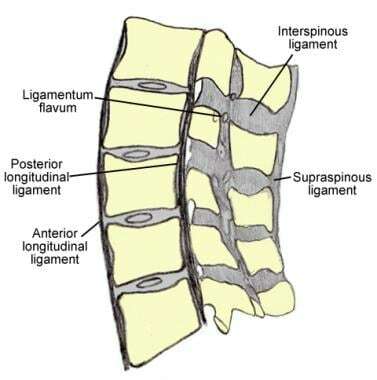 The ligamentum flavum (LF) bridges the interlaminar interval, attaching to the interspinous ligament medially and the facet capsule laterally, forming the posterior wall of the vertebral canal. It has a broad attachment to the undersurface of the superior lamina and inserts onto the leading edge of the inferior lamina. Normally, the ligament is taut, stretching for flexion and contracting its elastin fibers in neutral or extension. It maintains constant disc tension. The intertransverse ligament joins the transverse processes of adjacent vertebrae and resists lateral bending of the trunk. The iliolumbar ligament arises from the tip of the L5 transverse process and connects to the posterior part of the inner lip of the iliac crest. It helps the lateral lumbosacral ligament and the ligaments mentioned above stabilize the lumbosacral joint (see the following images). 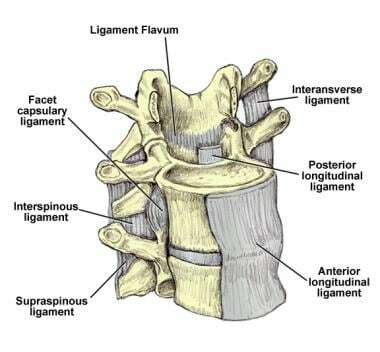 Anterolateral view of the lumbar spine demonstrating the multiple ligaments of the lumbar spine. These ligaments include the following: ligamentum flavum (LF), anterior longitudinal ligament (ALL), posterior longitudinal ligament (PLL), intertransverse ligament, interspinous ligament, supraspinous ligament, and facet capsular ligament. Lumbar spinal ligaments, lateral view. The extensor muscles are arranged in 3 layers. The largest group of intrinsic back muscles and primary extensor is the erector spinae (or sacrospinalis). In the lower L-spine, the erector spinae appears as a single muscle. At the upper lumbar area, it divides into 3 vertical columns of muscles (iliocostalis, longissimus, spinalis). Located posterolateral to the vertebral column, they have a common origin from a thick tendon that is attached to the sacrum, the lumbar spinous processes, and the iliac crest. The iliocostalis is the most lateral, and the spinalis (smallest muscle) is the most medial. The longissimus (largest muscle) inserts on to the skull base, whereas the iliocostalis inserts onto the angles of the ribs and transverse processes of the lower cervical vertebrae. As these muscles ascend up the vertebral column, they divide regionally depending on where the muscle attaches superiorly. A 3-layered fasciculated muscle, the transversospinal muscle group, lies deep to the erector spinae and originates on the mamillary processes in the lumbar spine. In the sacrum, it originates from the laminar area just medial to the posterior sacral foramina, from the tendinous origins on the erector spinae, and the medial surface of the posterior superior iliac spine (PSIS). Each fascicle is directed superomedially toward the inferior and medial margin of the lamina and adjacent spinous process. The superficial layer attaches from 3-4 levels above, the intermediate layer attaches 2 levels above, and the deep layer attaches 1 level above. The transversospinal muscle group acts both as an L-spine extensor and a rotator. 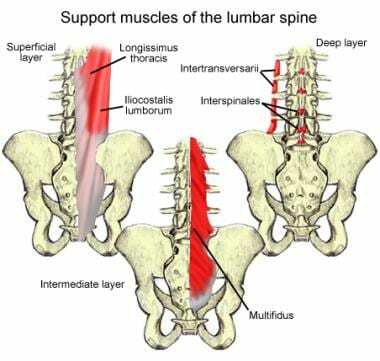 A multitude of small, segmental muscles are the deepest layer of the lumbar extensors. They can be divided into 2 groups, both innervated by the dorsal rami of spinal nerves. The levatores costarum are not typically present in the lumbar spine. The second group contains the interspinales and intertransversarii. The interspinales consists of short fasciculi attached between the spinous processes of contiguous vertebrae. The intertransversarii consist of 2-3 slips of muscles, which pass between adjacent transverse processes. They are postural stabilizers and increase the efficiency of larger muscle group action. Flexors of the L-spine are divided into an iliothoracic (extrinsic) group and a femorospinal (intrinsic) group. The iliothoracic group is made up of the abdominal wall muscles: rectus abdominis, external abdominal oblique, internal abdominal obliquus, and the transversus abdominis. The femorospinal group is made up of the psoas major and iliacus muscles. The psoas major originates from multiple areas: the anterior surface and lower border of transverse processes of L1-L5, from the bodies and discs of T12-L5. It inserts on to the lesser trochanter of the femur and is innervated by direct fibers of the lumbar plexus (L1-L3). Its primary action is hip and trunk flexion. True lateral flexion is normally a combination of side bending and rotation. Normally, side bending is brought about by ipsilateral contraction of the oblique and transversus abdominal muscles and quadratus lumborum. Of these, only unilateral contraction of the quadratus lumborum can bring about pure lateral flexion and elevation of the ilium, whereas bilateral contraction produces some lumbar extension. The quadratus lumborum is attached below to the iliolumbar ligament and to the adjacent part of the iliac crest above the lower anterior surface of the 12th rib and to the apexes of the L1-4 transverse processes. Rotation of the lumbar spine is brought about by the unilateral contraction of muscles that follow an oblique direction of pull; the more oblique the course, the more important the rotational effect. Most of the extensors and lateral flexors follow an oblique course and produce rotation when their primary component has been neutralized by antagonist muscle groups. The transversospinal muscle group, innervated by the dorsal rami of spinal nerves, is deep to the erector spinae muscle and runs obliquely (superomedially) from the transverse processes to the spinous processes. As a group, they act to extend the vertebral column. But, when contracted unilaterally, they cause the trunk to rotate in the contralateral direction. They are divided into 3 groups: the semispinalis, multifidus, and rotatores lumborum muscles. The rotatores lumborum are small, irregular, and variable muscles connecting the superoposterior part of the transverse process of the vertebra below to the inferolateral border of the lamina of the vertebra above. Lumbar vertebrae are contacted anterolaterally by paired lumbar arteries that arise from the aorta, opposite the bodies of L1-L4. Each pair passes anterolaterally around the side of the vertebral body to a position immediately lateral to the intervertebral canal and leads to various branches. The periosteal and equatorial branches supply the vertebral bodies. Spinal branches of the lumbar arteries enter the intervertebral foramen at each level. They divide into smaller anterior and posterior branches, which pass to the vertebral body and the combination of vertebral arch, meninges, and spinal cord, respectively. These arteries give rise to ascending and descending branches that anastomose with the spinal branches of adjacent levels. Nutrient arteries from the anterior vertebral canal travel anteriorly and supply most of the red marrow of the central vertebral body. The larger branches of the spinal branches continue as radicular or segmental medullary arteries, distributed to the nerve roots and to the spinal cord, respectively. Up to age 8 years, intervertebral discs have a good blood supply. Thereafter, their nutrition is dependent on diffusion of tissue fluids through 2 routes: (1) the bidirectional flow from the vertebral body to the disc and vice versa and (2) the diffusion through the annulus from blood vessels on its surface. As adults, the discs are generally avascular structures, except at their periphery. The venous drainage parallels the arterial supply. Venous plexuses are formed by veins along the vertebral column both inside and outside the vertebral canal (internal/epidural and external vertebral venous plexuses). Both plexuses are sparse laterally but dense anteriorly and posteriorly. The large basivertebral veins form within the vertebral bodies, emerge from the foramen on the posterior surfaces of the vertebral bodies, and drain into the internal vertebral venous plexuses, which may form large longitudinal sinuses. The intervertebral veins anastomose with veins from the cord and venous plexuses as they accompany the spinal nerves through the foramen to drain into the lumbar segmental veins. The tubular vertebral canal contains the spinal cord, its meninges, spinal nerve roots, and blood vessels supplying the cord, meninges, vertebrae, joints, muscles, and ligaments. Both potential and real spaces intervene between the spinal cord, meninges, and osseoligamentous canal walls. The canal is enclosed within its column and formed by the juxtaposition of the vertebral foramen, lined up with one another in series. The vertebral bodies and discs make up the anterior wall (with the PLL draped over it), whereas the laminae and ligamentum flavum border the canal posteriorly. Laterally, spinal nerves and vessels travel through the intervertebral foramen. The meninges consist of 3 layers: the pia, arachnoid, and dura mater. Together, they enhance the protection of the spinal cord and roots. The dura is the most superficial but resilient layer. The pia and arachnoid, together termed the leptomeninges, are frail. The spinal cord, roots, and nerve rootlets are closely invested by the pia. The dura and arachnoid together form a loose sheath (termed dural/thecal sac) around these structures, separated from the canal walls by the epidural space. The dura is composed of tough, longitudinal, collagen fiber bundles interwoven with circular elastic fibers. The external surface is rough and blends with loose connective tissue in the epidural space. The internal surface, facing into the subdural space, is smooth and covered by a layer of mesothelium. Inferiorly, the dural sac ends at the sacral canal, usually at S2-S3 (sometimes S1). The dura continues caudally as a fibrous thread named the filum terminale externum or coccygeal ligament, which blends with the PLL over the coccyx. The dural sac sends sleevelike projections into the intervertebral foramen, where the dura blends with the epineurium of the spinal nerves. Connective tissue slips in the foramen anchor the dural sleeves so that they can protect the spinal nerve roots from being stretched during L-spine movements. In addition to these tetherings, the dura is attached in places to the PLL. The epidural (peridural/extradural) space terminates inferiorly at the sacral hiatus, where it is sealed by the posterior sacrococcygeal ligaments. The nerve roots transverse the space as they extend into the intervertebral foramen. The entire space is occupied by loose connective tissue with variable fat content, providing padding around the dural sac and spinal cord and acting as a form to hold the thin internal vertebral plexus of veins open. The vertebral venous plexus is embedded in the epidural loose connective tissue, sometimes transmitting large amounts of blood. The pia and arachnoid are delicate membranes composed of loose connective tissue and separated from one another by the subarachnoid space. A layer of mesothelium covers all leptomeningeal surfaces bathed by cerebrospinal fluid (CSF). The arachnoid mater lines the entire dural sac and extends into the dural sleeves. It also sends trabeculae across the subarachnoid space to the pia, facilitating CSF mixing. Along the posterior midline, the trabeculae form a well-defined subarachnoid septum. Inferiorly, it lines the dural sac within the sacral canal and ends on termination of the sac at the S2 vertebral level. The pia mater provides support for the vasculature and nerves in the subarachnoid space. It adheres intimately to the spinal cord. The pia forms a separate sheath for each nerve rootlet and root as far laterally as the foramen, blending with the epineurium. Caudally, the pia continues as the thin filum terminale internum. After reaching the lower end of the dural sac, the filum becomes enclosed within the filum terminale externum and continues to the coccyx. The spinal subarachnoid space is spacious in the lumbar spine, and below the level of L2 it is termed the lumbar cistern. Its CSF content (20-35 mL) is only a fraction of the total CSF volume (120-150 mL). The lower third of the arachnoid sac contains only the filum terminale internum and the cauda equina, which contains lumbar, sacral, and coccygeal nerve roots that hang like a horse’s tail form the lower part of the spinal cord (conus medullaris) as they leave the vertebral canal below the lower third of the arachnoid sac. Other than the brain, the spinal cord is one of the 2 anatomic components of the central nervous system (CNS). It is the major reflex center and conduction pathway between the brain and the body. As noted earlier, the spinal cord normally terminates as the conus medullaris within the lumbar spinal canal at the lower margin of the L2 vertebra, although variability of the most caudal extension exists (see the following image). In a cadaveric study of 129 cadaveric specimens, the spinal cord terminated at L2 in 60%, L1 in 30%, and L3 in 10% of specimens. Differential growth rates in the spinal cord and the vertebral canal are the cause of these disparities. Exceptions also include patients with congenital spinal deformities known as spina bifida. In such patients, the conus medullaris can be displaced downward to the middle or lower lumbar spine. Since early in development, these roots proceed independently toward their respective foramen, traversing the subarachnoid space within the dural sac/sleeves. They pierce the dura separately before they blend with each other at the foramen. In the lateral portion, they travel in the dural sleeve. There may be separate dural sleeves around the posterior and anterior roots for a given spinal nerve, or the 2 sleeves may be fused. Each root is bathed by CSF from a separate arachnoid sheath around it. The dural sleeves in the lumbar region are longer and travel in a more inferolateral route upon exiting. Cell bodies of the motor nerve fibers are located in the ventral or anterior horns of the spinal cord, whereas those of the sensory nerve fibers are in a dorsal root ganglion (spinal ganglion) at each lumbar and sacral level. Dorsal root ganglia (DRG) tend to be located within the neural foramina and are, therefore, not strictly speaking within the lumbar canal. However, at the low lumbar (and sacral), levels, the DRG tends to reside proximal to the neural foramina, within the spinal canal, as found in 11-38% of cases at L5 and 71% at S1. [8, 9] The dorsal root ganglia are attached to the margins of the intervertebral foramina. Lumbar spinal nerves exit the vertebral canal by passing inferior to the pedicles of the corresponding vertebrae since early in development. In the lumbar region, the first division of the spinal nerve takes place within the intervertebral foramen, resulting in the posterior and anterior (dorsal and ventral) rami. The posterior rami pass posteriorly, skirting the articular processes at that level, whereas the anterior rami proceed laterally to supply the body wall and the lower limbs. In the lumbar vertebral canal, the posterior and anterior roots of a given nerve (enclosed in their dural sacs) cross the intervertebral disc that is located above the pedicle below which the nerve exits. For example, the L2 nerve roots cross the disc between L1 and L2 vertebrae before reaching the appropriate foramen, below the pedicle of the L2 vertebra. Lumbar spinal nerves give off one or more recurrent meningeal branches, known as the sinuvertebral nerves. These branches originate from the autonomic nervous system, paravertebral plexuses, and overlying muscles distal to the DRG. The sinuvertebral nerves reenter the vertebral canal and carry with them sensory and sympathetic efferent fibers. Similar to the spinal branches of lumbar arteries, each nerve divides into ascending and descending branches to supply the periosteum, PLL, and outer anular laminae. The ALL is richly innervated by nerve fibers from the sympathetic system. The sinuvertebral nerves are also sensory to the meninges and the walls of the vertebral venous plexuses. They furnish the vasomotor fibers that regulate blood flow in the arteries and internal vertebral venous plexuses. Anatomically, the ventral and dorsal (anterior and posterior) rami arise from the spinal nerve, just as it exits the foramen. The ventral primary ramus participates in the formation of the lumbosacral plexus and also provides a few nerve endings to the adjacent superficial anulus fibrosus of intervertebral discs. Otherwise, discs are considered non-innervated structures. The dorsal primary ramus divides into medial, intermediate, and lateral branches just after it gives off an ascending facet branch to the dorsal aspect of the joint immediately above. The intermediate and lateral branches course laterally on the transverse process and supply the erector spinae muscles. 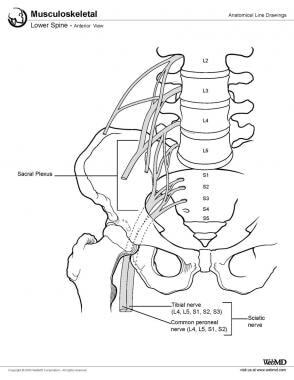 Each medial branch of the posterior primary ramus participates in the innervation of 3 facet joints: one branch innervates the facet joint above the level, the second branch innervates at that level, and the third branch descends caudally to the level below. See the following image. Innervation of the facet joints; dorsal ramus innervation (medial and lateral branches). MAL23 = mamillo-accessory ligament bridging the mamillary and accessory processes of L2 and L3; Z-joint = zygapophyseal joint. Congenital vertebral anomalies consist of a collection of malformations of the spine. Most are not clinically significant, but they may cause compression of the spinal cord and nerves, or they may cause instability. Drake R, Vogl W, Mitchell AVM, Mitchell A. Gray's Anatomy for Medical Students. 2nd ed. New York, NY: Churchill Livingstone; 2009. Hall-Craggs ECB. Anatomy as a Basis for Clinical Medicine. 2nd ed. Baltimore, Md: Urban & Schwarzenberg; 1990. Kirkaldy-Willis WH, Bernard TN Jr. The anatomy of the lumbosacral spine. Managing Low Back Pain. 4th ed. New York, NY: Churchill Livingstone; 1999. Chapter 2. Moore KL, Dalley AF. Back. Clinically Oriented Anatomy. 5th ed. Baltimore, Md: Lippincott Williams & Wilkins; 2006. chapter 4. Pansky B. Review of Gross Anatomy. 6th ed. New York, NY: McGraw-Hill Medical; 1996. Rosse C, Gaddum-Rosse P. The vertebral canal, spinal cord, spinal nerves, and segmental innervation. Rosse C, Gaddum-Rosse P, eds. Hollinshead's Textbook of Anatomy. 5th ed. Philadelphia, Pa: Lippincott-Raven; 1997. Chapters 12-13. Wong DA, Transfeldt E. Musculoskeletal anatomy, neuroanatomy, and biomechanics of the lumbar spine. Wong DA, Transfeldt E, eds. Macnab's Backache. 4th ed. Philadelphia, Pa: Lippincott Williams & Wilkins; 2007. chapter 1. Hamanishi C, Tanaka S. Dorsal root ganglia in the lumbosacral region observed from the axial views of MRI. Spine (Phila Pa 1976). 1993 Oct 1. 18(13):1753-6. [Medline]. Kikuchi S, Sato K, Konno S, Hasue M. Anatomic and radiographic study of dorsal root ganglia. Spine (Phila Pa 1976). 1994 Jan 1. 19(1):6-11. [Medline]. 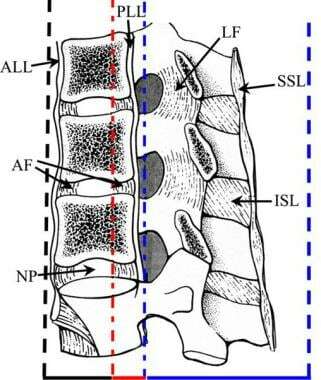 Bogduk N. The anatomy of the lumbar intervertebral disc syndrome. Med J Aust. 1976 Jun 5. 1(23):878-81. [Medline]. Hughes RJ, Saifuddin A. Imaging of lumbosacral transitional vertebrae. Clin Radiol. 2004 Nov. 59(11):984-91. [Medline]. Hughes RJ, Saifuddin A. Numbering of lumbosacral transitional vertebrae on MRI: role of the iliolumbar ligaments. AJR Am J Roentgenol. 2006 Jul. 187(1):W59-65. [Medline]. Bertolotti M. Contributo alla conoscenza dei vizi di differenzazione regionale del rachide con speciale reguardo all assimilazione sacrale della V. lombare. La Radiologia Medica. 1917. 4:113-44. Almeida DB, Mattei TA, Sória MG, Prandini MN, Leal AG, Milano JB. Transitional lumbosacral vertebrae and low back pain: diagnostic pitfalls and management of Bertolotti's syndrome. Arq Neuropsiquiatr. 2009 Jun. 67(2A):268-72. [Medline]. van Tulder MW, Assendelft WJ, Koes BW, Bouter LM. Spinal radiographic findings and nonspecific low back pain. A systematic review of observational studies. Spine (Phila Pa 1976). 1997 Feb 15. 22(4):427-34. [Medline]. Tini PG, Wieser C, Zinn WM. The transitional vertebra of the lumbosacral spine: its radiological classification, incidence, prevalence, and clinical significance. Rheumatol Rehabil. 1977 Aug. 16(3):180-5. [Medline]. Elster AD. Bertolotti's syndrome revisited. 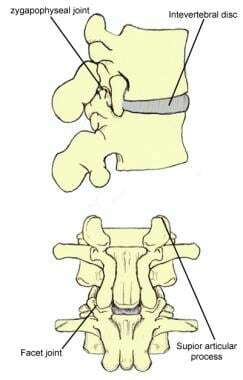 Transitional vertebrae of the lumbar spine. Spine (Phila Pa 1976). 1989 Dec. 14(12):1373-7. [Medline]. Nachemson A. Towards a better understanding of low-back pain: a review of the mechanics of the lumbar disc. Rheumatol Rehabil. 1975 Aug. 14(3):129-43. [Medline]. Castellvi AE, Goldstein LA, Chan DP. Lumbosacral transitional vertebrae and their relationship with lumbar extradural defects. Spine (Phila Pa 1976). 1984 Jul-Aug. 9(5):493-5. [Medline]. Luoma K, Vehmas T, Raininko R, Luukkonen R, Riihimäki H. Lumbosacral transitional vertebra: relation to disc degeneration and low back pain. Spine (Phila Pa 1976). 2004 Jan 15. 29(2):200-5. [Medline]. Wigh RE, Anthony HF Jr. Transitional lumbosacral discs. probability of herniation. Spine (Phila Pa 1976). 1981 Mar-Apr. 6(2):168-71. [Medline]. Chang HS, Nakagawa H. Altered function of lumbar nerve roots in patients with transitional lumbosacral vertebrae. Spine (Phila Pa 1976). 2004 Aug 1. 29(15):1632-5; discussion 1635. [Medline]. Otani K, Konno S, Kikuchi S. Lumbosacral transitional vertebrae and nerve-root symptoms. J Bone Joint Surg Br. 2001 Nov. 83(8):1137-40. [Medline]. Delport EG, Cucuzzella TR, Kim N, Marley J, Pruitt C, Delport AG. Lumbosacral transitional vertebrae: incidence in a consecutive patient series. Pain Physician. 2006 Jan. 9(1):53-6. [Medline]. Lateral view of the human lumbar spine, including the lumbosacral junction. Lumbar vertebrae are labeled L1 through L5. Note the spinous processes and facet joints at each vertebral junction.